Conquest of the universe rests upon the immediate termination of all Autobots! Cybertron and Earth are not enough for this power-hungry Decepticon! Now he wants the whole galaxy! 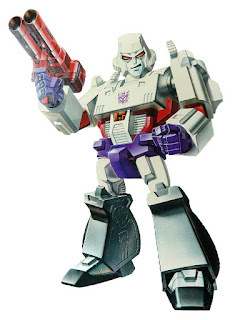 More ferocious and powerful than ever, this living engine of evil seeks the worlds throughout the cosmos and utterly crushes all those who dare defy him, especially the Autobots. 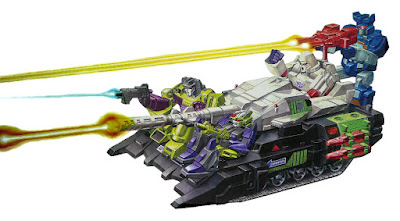 In pursuit of these grisly goals, he drives the Neutro-Fusion Tank, a high-impact battle tank armed with fusion cannon, corrosive smoke shells, anti-aircraft photon machine guns, and heat-seeking mechano-sensors. The tank converts into a ground-to-air, wire-guided missile launcher, and search and destroy jet throne.